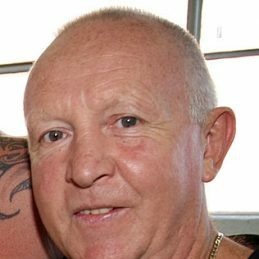 Barry Michael was the torchbearer for Australian boxing in the 1970s and 1980s. His glittering career was capped on July 12, 1985, when he won the IBF world super-featherweight championship over 15 rounds against fellow Australian Lester Ellis at Melbourne’s Festival Hall. Barry held the title for more than two years and made three successful defences. By the time he hung up the gloves he had compiled 48 victories and three draws from 60 bouts around the globe, with Commonwealth and Australian titles to go with his world crown. Barry is still involved in boxing as a promoter and media commentator with Fox Sports and the Herald-Sun. Another of Barry’s earlier fights, with Al “Earthquake” Carter in September 1981 in Melbourne saw Mercurio in the middle. “Barry threw “Earthquake” a kiss before the fight,” he said. “”Earthquake” came out and hit Barry with a shot in the shoulder, which turned Barry white. It was a hell of a fight. Barry could get under a fighter’s skin. He would talk his way through a fight. He deserved a lightweight title fight two or three years before he got one. People were ducking him. The American matchmaker Don Elbaum came out to watch Michael. No one would fight him though. He was going to fight Ray Mancini at one stage and they knocked him back. He was too tough. Barry was a real tough “son of a gun”. Michael Barry was born on 2 June 1955 in England and his family migrated to Australia in 1957. Like so many before him, Barry Michael started his career on Melbourne’s TV Ringside in June 1973. His first title was the Victorian Lightweight title in 1975, adding the Junior Lightweight title the next year. He first surprised boxing followers by winning the Australian Lightweight title by beating Billy Mulholland in 1978. He defended this title for seven years. In 1981, he took another step by claiming the Commonwealth crown from Zimbabwean, Langon Tinago, but soon after lost it. To some it looked like the pugilistic career of Barry Michael had run its course… until another Victorian, Lester Ellis, won the IBF World Junior Lightweight crown and started looking around for a local challenger. With proper time and diet, Michael reduced his fighting weight down, and a capacity crowd packed Festival Hall in Melbourne on July 12, 1985 to see the seasoned veteran, 30 year old Barry Michael, challenge the young lion, 20 year old Lester Ellis for Ellis’ world championship belt which he had held for just 5 months. In a very tough encounter, Michael outsmarted Ellis over 15 rounds, winning on points. Barry Michael made three successful defences of his title before surrendering it in 1987.